Though of a small size and squeezed in between Nepal, Tibet and Bhutan, Sikkim has probably the most diverse landscape of all Himalayan countries. In the north it reaches into the Tibetan plateau, to the east and west high ranges form the border to its neighbors, and in the south are dense forests and tea plantations that separate it from the hot Bengali plain. Rice terraces cling to the steep hillsides. Orchids grow in the dense forests and jungles. 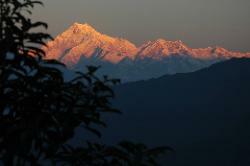 The most dominating feature is Kangchenjunga, the world's third highest peak that reaches 8'858 meters into the sky. In west Sikkim, 50 km north of the famous town of Darjeeling, lies a well-trodden and still very rewarding area for trekking. The Dzongri Goeche La trek takes you from dense forests up to high-altitude grazing grounds and from there to barren glaciers. Literally the high point of the trek is Goeche La, a pass at the foot of Kangchenjunga. From there we turn back and walk to Labdang, a small village near Tashiding. Detailed travelogues, pictures and map of Goecha La. North Sikkim is partially opened for tourists. The word unexplored in its strictest sense by might not be suitable anymore, but North Sikkim comes as close to it as possible. I managed to get the permissions and spent almost two weeks in the valley of Zachu. Situated at 4'500 meters, the lush vegetation from southern Sikkim has gone, and wide glacial valleys and hanging glaciers dominate the scenery. Their reflections in the lakes and ponds invite for daytrips before we finally cross the Tsaru La into the Deuthang valley. Detailed travelogues, pictures and maps of Zachu. Another fine trek in North Sikkim which covers much ground is the traverse of the mountains between Lachung and Lachen, and then up the Zemu glacier, over the Kishong La (aka Yumtso La?) into the valley of the remote Tholung monastery. From dense forests to snow-covered passes, the trek offers a large variety of terrain. Red tape has to be dealt with, because part of the trek goes into the Green Lake area, but it is worth it. It is off-the-beaten-track, even for locals, but still easy enough for trekkers. Detailed travelogues, pictures and map of The North Sikkim Traverse.